MIT engineers have just introduced an element of fun into microfluidics. The field of microfluidics involves minute devices that precisely manipulate fluids at submillimeter scales. Such devices typically take the form of flat, two-dimensional chips, etched with tiny channels and ports that are arranged to perform various operations, such as mixing, sorting, pumping, and storing fluids as they flow. Now the MIT team, looking beyond such lab-on-a-chip designs, has found an alternative microfluidics platform in "interlocking, injection-molded blocks" – or, as most of us know them, LEGO bricks. In a paper published in the journal Lab on a Chip, the team describes micromilling small channels into LEGOs and positioning the outlet of each "fluidic brick" to line up precisely with the inlet of another brick. The researchers then sealed the walls of each modified brick with an adhesive, enabling modular devices to be easily assembled and reconfigured. Each brick can be designed with a particular pattern of channels to perform a specific task. The researchers have so far engineered bricks as fluid resistors and mixers, as well as droplet generators. Their fluidic bricks can be snapped together or taken apart, to form modular microfluidic devices that perform various biological operations, such as sorting cells, mixing fluids, and filtering out molecules of interest. "You could then build a microfluidic system similarly to how you would build a LEGO castle – brick by brick," says lead author Crystal Owens, a graduate student in MIT's Department of Mechanical Engineering. "We hope in the future, others might use LEGO bricks to make a kit of microfluidic tools." Hart, who is also director of MIT's Laboratory for Manufacturing and Productivity and the Mechanosynthesis Group, primarily focuses his research on new manufacturing processes, with applications ranging from nanomaterials to large-scale 3-D printing. "Over the years, I've had peripheral exposure to the field of microfluidics and the fact that prototyping microfluidic devices is often a difficult, time-consuming, resource-intensive process," Hart says. Owens, who worked in a microfluidics lab as an undergraduate, had seen firsthand the painstaking efforts that went into engineering a lab on a chip. After joining Hart's group, she was eager to find a way to simplify the design process. Most microfluidic devices contain all the necessary channels and ports to perform multiple operations on one chip. Owens and Hart looked for ways to, in essence, explode this one-chip platform and make microfluidics modular, assigning a single operation to a single module or unit. A researcher could then mix and match microfluidic modules to perform various combinations and sequences of operations. 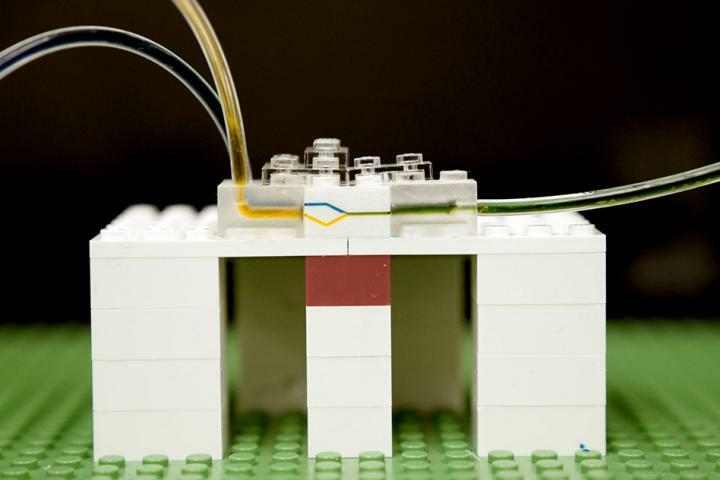 In casting around for ways to physically realize their modular design, Owens and Hart found the perfect template in LEGO bricks, which are about as long as a typical microfluidic chip. "Because LEGOs are so inexpensive, widely accessible, and consistent in their size and repeatability of mounting, disassembly, and assembly, we asked whether LEGO bricks could be a way to create a toolkit of microfluidic or fluidic bricks," Hart says. To answer this question, the team purchased a set of standard, off-the-shelf LEGO bricks and tried various ways to introduce microfluidic channels into each brick. The most successful method turned out to be micromilling, a well-established technique commonly used to drill extremely fine, submillimeter features into metals and other materials. Owens used a desktop micromill to first mill a simple, 500-micron-wide channel into the side wall of a standard LEGO brick. She then taped a clear film over the wall to seal it and pumped fluid through the brick's newly milled channel. She observed that the fluid successfully flowed through the channel, demonstrating the brick functioned as a flow resistor – a device that allows very small amounts of fluid to flow through. Using this same technique, she fabricated a fluid mixer by milling a horizontal, Y-shaped channel, and sending a different fluid through each arm of the Y. Where the two arms met, the fluids successfully mixed. Owens also turned a LEGO brick into a drop generator by milling a T-shaped pattern into its wall. As she pumped fluid through one end of the T, she found that some of the liquid dropped down through the middle, forming a droplet as it exited the brick. To demonstrate modularity, Owens built a prototype onto a standard LEGO baseplate consisting of several bricks, each designed to perform a different operation as fluid is pumped through. In addition to making the fluid mixer and droplet generator, she also outfitted a LEGO brick with a light sensor, precisely positioning the sensor to measure light as fluid passed through a channel at the same location. Owens says the hardest part of the project was figuring out how to connect the bricks together, without fluid leaking out. While LEGO bricks are designed to snap securely in place, there is nevertheless a small gap between bricks, measuring between 100 and 500 microns. To seal this gap, Owens fabricated a small O-ring around each inlet and outlet in a brick. "The O-ring fits into a small circle milled into the brick surface. It's designed to stick out a certain amount, so when another brick is placed beside it, it compresses and creates a reliable fluid seal between the bricks. This works simply by placing one brick next to another," Owens says. "My goal was to make it straightforward to use." "An easy way to build"
The researchers note just a couple drawbacks to their method. At the moment, they are able to fabricate channels that are tens of microns wide. However, some microfluidic operations require much smaller channels, which cannot be made using micromilling techniques. Also, as LEGO bricks are made from thermoplastics, they likely cannot withstand exposure to certain chemicals that are sometimes used in microfluidic systems. "We've been experimenting with different coatings we could put on the surface to make LEGO bricks, as they are, compatible with different fluids," Owens says. "LEGO-like bricks could also be made out of other materials, such as polymers with high temperature stability and chemical resistance." For now, a LEGO-based microfluidic device could be used to manipulate biological fluids and perform tasks such as sorting cells, filtering fluids, and encapsulating molecules in individual droplets. The team is currently designing a website that will contain information on how others can design their own fluidic bricks using standard LEGO pieces. "Our method provides an accessible platform for prototyping microfluidic devices," Hart says. "If the kind of device you want to make, and the materials you work with, are suitable for this kind of modular design, this is an easy way to build a microfluidic device for lab research." This research was supported in part by a National Science Foundation Graduate Research Fellowship, the MIT Mechanical Engineering Department Ascher H. Shapiro Fellowship, the MIT Lincoln Laboratory Advanced Concepts Committee, a 3M Faculty Award, and the National Science Foundation EAGER/Cybermanufacturing Program.